Food Wishes Video Recipes: Happy St. Patrick's Day! 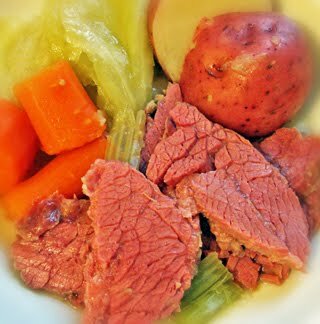 I made your corned beef and cabbage eariler this week. My first time ever making this dish. It turned out divine! Thank you. Happy "Bushels of Blarney" Day! May you do a video on the process of 'corning' the beef at home? Hey John, are you from Illinois per chance? I saw someone post a picture on the channel 5 news weather photos section - they insisted in being called "Chef John"
I've corned beef at home a few times now, and the results are always WAY better than that brine-injected dross sold at the supermarket. If you're interested in charcouterie at home it is well worth your while to order some cure #2 (pink salt/sodium nitrite). It's cheap, and a little goes a long way. No corned beef hash this morning - I didn't have time. But I may try making fried potato cakes with all this leftover colcannon. It was delicious, mind you; I just made way too much! Chris, thanks for the link. Good luck with the lamb conversion! What cut of meat do you make corned beef with Chef John? None of the supermarkets around here have the meat cut labeled as corned beef. I have tried asking the employees and I get blank stares. Thank you very much. I shall now proceed to enjoy my corned beef and mustard sandwiches.